Last year heralded a raft of significant changes in Isuzu Ute Australia’s (IUA) D-Max and MU-X line-up. In its first-quarter 2017 launch on Queensland’s Sunshine Coast, Isuzu officially revealed the range’s new 3.0-litre engine, new six-speed automatic transmission, and upgraded Aussie-specific suspension – all engineered for Australian drivers and our unique driving conditions – as well as a few nifty styling improvements, including a new front-end. Well, this year Isuzu chose the Mt Cotton driver training centre, just outside of Brisbane, as the venue to let Australian motoring journalists loose in some new D-Maxs and MU-Xs. The changes this time around aren’t anywhere near as big as they were last year but Isuzu is hoping that extra safety features as standard, styling tweaks and value-added service intervals will help to build on growing buyer interest in its ute and SUV range. There are 23 variants in the D-Max line-up, ranging from the 4x2 single cab chassis SX manual ($28,600) through to the new LS-T (formerly known as the LS-Terrain), costing $54,700 (recommended retail price). The LS-T shown here is the highest variant in the D-Max line-up. There are four variants in the crew cab (dual-cab) range – SX, LS-M, LS-U and the new LS-T (formerly known as the LS-Terrain), which we’ll focus on in this yarn. There are 4x4 and 4x2 variants for everything in the 2018 D-Max range; and manual or auto transmissions for a lot of the line-up everything. The LS-T is auto only and costs $54,700 (recommended retail price). Available in 4x4 or 4x2 guise, the LS-T gets, above and beyond what came before, perforated leather on body-contact areas, soft-touch leatherette in other spots (also in LS-m and LS-U), 18-inch wheels, sat nav, roof-rails, and two USB charge points. 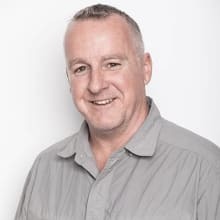 Safety upgrades include trailer sway control for all new D-Maxs – except the 4x2 low-ride SX single cab chassis manual – and rear bumper and reversing camera as standard on everything, except cab chassis models, but it is an option on those. 'Magnetic Red' is one of the newly introduced optional colours (LS-U shown). There are also three new exterior colours available for the D-Max: 'Magnetic Red Mica', 'Cobalt Blue Mica' and 'Graphite Grey Metallic'. The new MU-X also has the Magnetic Red Mica option. 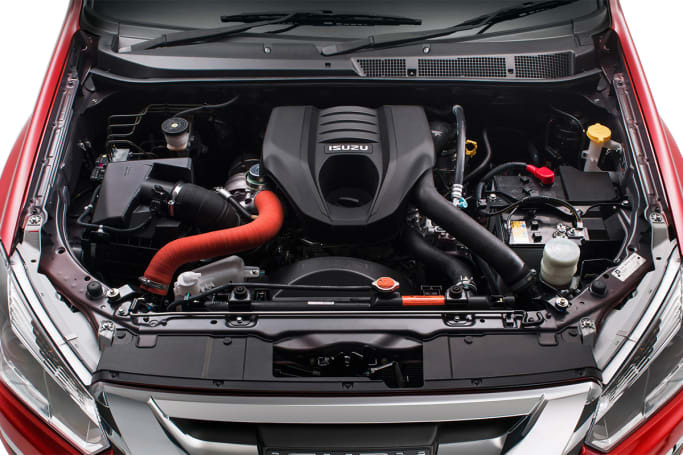 All D-Max variants are powered by the same 3.0-litre diesel engine. The Euro 5 compliant 3.0-litre four-cylinder common rail diesel engine, producing 130kW at 3600rpm and 430Nm from 2000-2200rpm, stays, and is matched to a six-speed Aisin-sourced automatic transmission. Inside, the cabin has a more premium feel. Nothing has changed on the D-Max’s outside – it looks chunky, solid and purpose-built for adventure – but the LS-T’s interior now has that perforated leather on body-contact areas and soft-touch leatherette elsewhere. Inside the cabin remains functional but it now has a more premium feel. We didn’t have the opportunity to spend very much time in the D-Max this time around but it appears to have retained the previous generation’s easy-to-live-with attributes. 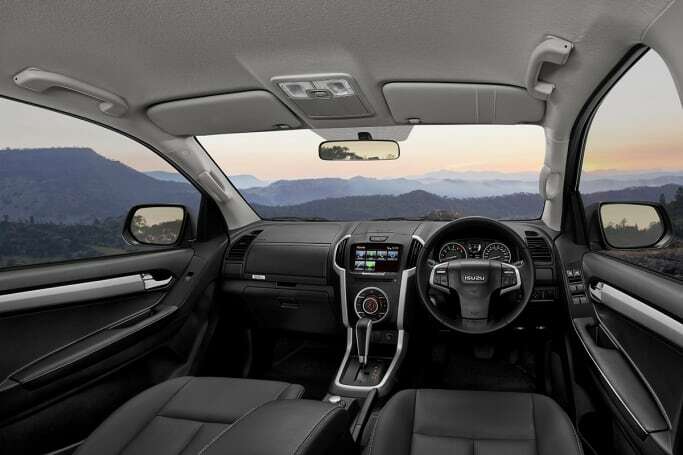 Everything is clear to see (the 8.0-inch touchscreen is a good unit), easy to use (big buttons, dials and knobs abound) and the cabin is roomy, comfortable, and hard wearing. Build quality and fit and finish remains solid and touring-ready. The D-Max's tray is 1552mm long (at floor level), 465mm deep and 1530mm wide across the top, 1105mm wide, between wheel arches. It has four tie-down points in the tray, one at each corner. This D-Max has a 1024kg payload, 3050kg GVM, a maximum braked towing capacity of 3500kg and 750kg unbraked. We only did brief drive loops on the launch, including a decent off-road course and towing a 1750kg boat with a D-Max on a twisting bitumen road, designed to replicate real-world driving conditions. Running 20 psi (pounds per square inch) in our Bridgestone Dueler or Toyo Open Country tyres, the Isuzus handled everything on the 4WD loop with ease, including runs up and down steep greasy-muddy hills peppered with rocks and tree-root hazards, tight turns in between trees, plowing through mud puddles and more. No surprise at its efficacy on rough terrain because it works off the proven 4X4 'Terrain Command' system, operated via a dial near the auto shifter, and which can be switched on the fly from 2High to 4High at speeds of up to 100km/h. To engage 4L you need to be stationary. The LS-T is 5295mm long, 1860mm wide (excluding wing mirrors), 1855mm high (excluding roof rails) and has a 3095mm wheelbase and 1570mm track. It has a 12.6m turning circle. Kerb weight is listed as 2026kg. It has 235mm ground clearance, 30 degrees approach angle, 22.7 degrees departure angle, and 22.3 degrees ramp-over angle. The LS-T's wading depth is 600mm. 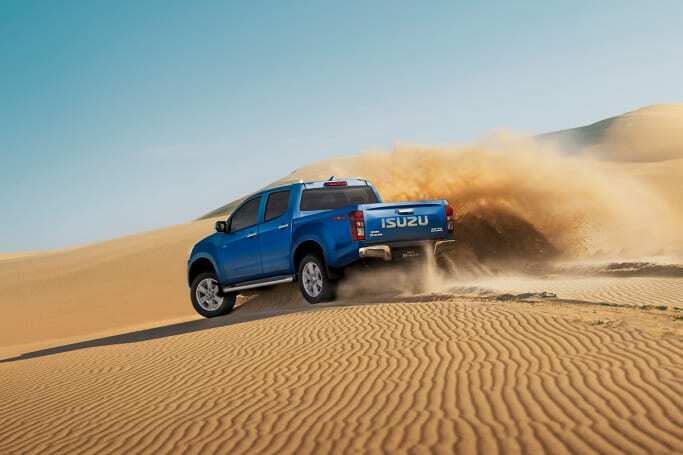 The Isuzu ute retains the previous generation’s hill start assist (designed to hold gear during climbs) and hill descent control (which maintains engine-braking speed on downhills and is able to be regulated with acceleration or braking). The D-Max’s underbody protection includes under-front steel plate skid/splash shield and steel plate guards on the sump, transfer case and fuel tank leading edge; and sheet steel under the fuel tank. It has double wishbones and coil springs up front and leaf springs at the rear, reduced from a five-span spring set-up to three, which has resulted in a softer and more comfortable D-Max ride than before. We had the opportunity to drive a 2017 and a 2018 model back-to-back through lumpy sections at different speeds and the newer model exhibited a clear advantage in the ride and handling stakes over its older version. 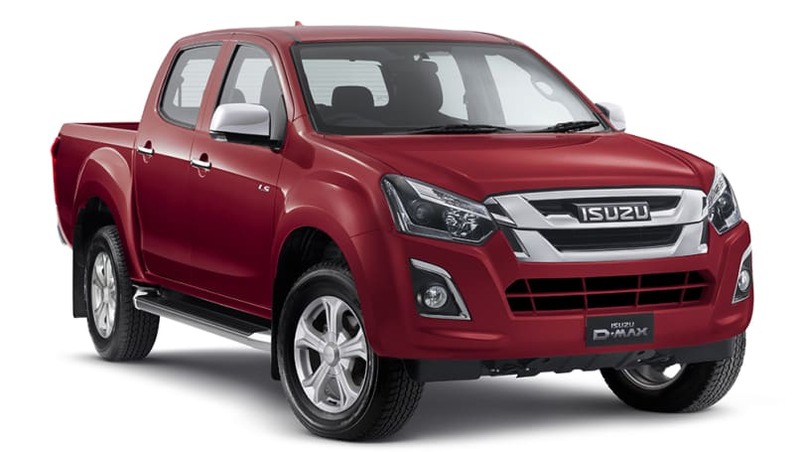 We only got the chance to spend very little time in any new models and we’d have to drive it for a week or more to get a good handle on real-world fuel consumption but Isuzu claims the D-Max gets through 7.9L/100km (combined cycle). It has a 76-litre fuel tank. The D-Max has a maximum five-star ANCAP rating from November 2016. As mentioned, noteworthy safety upgrades include trailer sway control for all new D-Maxs – except the 4x2 low-ride SX single cab chassis manual – and rear bumper and reversing camera as standard on everything, except cab chassis models, but it is an option on those. Other standard safety gear includes six airbags (dual front, side and full-length curtain), ABS with electronic brake-force distribution, ESC, traction control and EBA (emergency brake assist), 'Hill Start Assist' and 'Hill Descent Control', plus three top-tether ISOFIX child-seat points in the rear seat. It has a five-year/130,000km warranty, with five years of roadside assist and five-year/75,000km capped price service costs. Servicing is recommended at 12-month/15,000km intervals. Prices are: $350 (at 12 months/15,000km), $450 (at 24 months/30,000km), $500 (at 36 months/45,000km) $450 (at 48 months/60,000km) and $340 at 60 months/75,000km – for a total cost of $2090. 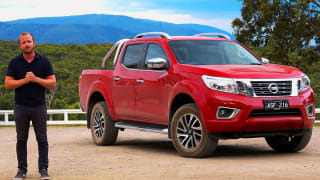 The D-Max was already a solid choice for those interested in a functional family-friendly ute and it seems Isuzu might be justified in banking on the new LS-T’s premium appeal, as well as the range’s safety upgrades, extended service intervals and styling tweaks for even more sales. What do you think of the new D-Max? Tell us in the comments below. 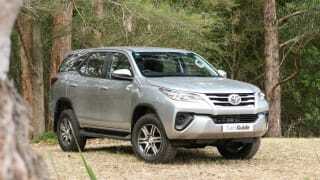 Toyota's Fortuner wagon is based on the same platform as the HiLux ute, save for its coil-spring rear suspension. It's taken a price cut for 2018, and has gained a couple of tweaks along the way.